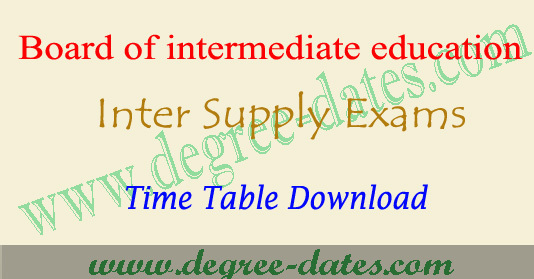 Here we provide our degree-dates.com team AP Inter Supply exam time table 2017,ap 1st year supplementary exam time table 2017,ap 2nd year supplementary exam time table 2017,ap 1st year and 2nd year vocational supply time table 2017 and ap intermediate Improvement exam schedule. AP inter Advanced Supplementary Public Examinations, May/June 2017 are scheduled to be held from 15th May 2017 to 23rd May 2017.All the Principals of Jr colleges are informed that the Intermediate Advanced Supply Examinations, May/lune 2017 (Theory) will be held from 15th May 2017 to 23rd May 2017. 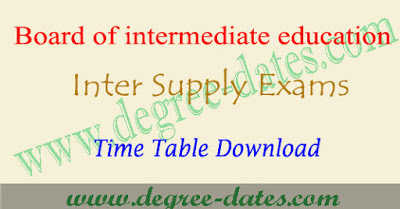 A copy of the detailed ap inter supply timetable 2017 is also available in the BIE Web-site www.bieap.gov.in. The AP intermediate First Year examination will be held from 9.00 A.M to 12.00 Noon in Fore Noon session and AP intermediate Second Year Examination from 2.30 P.M to 5.30 P.M in After Noon session every day. Therefore, you are requested to give special emphasis on the dates & timings of the examinations. AP Inter supply Practical Examinations will be held from 24-05-2017 to 28-05-2017 in two sessions from 9.00 AM to 12.00 PM & 2.00 PM to 5.00 PM. Ethics and Human Values Examination will be conducted on 29-05-2017 (One day) from 10.00 AM to 1.00 P.M. The Environmental Education Examination will be conducted on 30-05-2017 from 10.00 A.M to 1.00 P.M (One day). Wide publicity among the students, parents and staff should be given regarding the dates of examinations and also due dates for payment of Examination fee for IPASE May/June 2017 in their Junior Colleges without fail.